Since opening in August, the excellent new bar, Cooper’s Union has brought the class of a Manhattan style mixology across the river into Hoboken. Tucked in a nook on Hudson Street, replacing the now defunct McCarthy’s, Cooper’s just feels different, bringing a certain revitalization of sorts to a Square Mile that has time and again witnessed facelifts for underwhelming retread bars. Although Cooper’s Union technically is an in with the new type bar, the energy and the vibe inside can be felt immediately, as if you’re discovering someplace cool and fun before anyone else knows about it. Sticking to the creedo of owner Pat Walsh, “when you walk in here, we want you to feel like you could be at any bar in any city,” the hustle of the Path train exodus behind you stays at the door. The interior is new and modern. The typically weathered furniture and distressed wood bar that we’ve been finding week after week from years of wear and tear don’t exist here. Instead, white Christmas lights help illuminate a shiny new long bar in back, with a smallish restaurant in front separating the hungry eaters from the rowdy drinkers. The bar has an excellent selection of draught beers, including one of the finest pours of Guinness that you’ll find anywhere locally- Manhattan included. 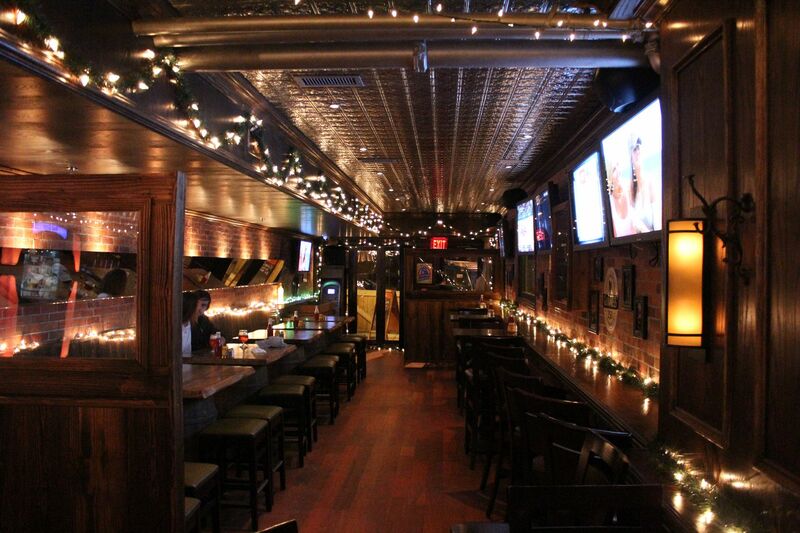 Also of note, as Wednesdays in Hoboken have been incredibly quiet week after week, Cooper’s Union had a sizable crowd, both hovering over the shuffleboard table in back and surrounding the bar area. Behind the bar sits framed photographs along the wall- reminiscent of what a bar might look like if you decided to turn your basement into one- a cozy, modern little haunt. While the beers are cheap and the place strongly encourages the use of social media outlets like Twitter and FourSquare, Cooper’s Union is worth stopping by for their excellent house made cocktails and their eclectic menu, which contains an entire portion of frankfurters- from chili cheese to Chicago style to their “low rider dog,” packed with salsa, guacamole, and jalapenos. Sides like the creamy potato salad, tater tots, and the Bavarian pretzels with honey and mustard were also particularly eye catching. But the friendly barkeep and a brand new feel made Cooper’s Union worth going out of my way to stumble into. Preconceived notion – Really didn’t have one. It sounded like I would either get a pint at an old school divey pub or open a student line of credit there. Crowd stereotype – 20’s to late 30’s type, neighborhood locals stopping in for a post-work pop. Music – Cooper’s has a juke, but on this night it was poppy music- and I can’t be certain, but I don’t believe it was in English. Value – Competitively priced draughts during the week, but when we starting slugging back their specialty mixed drinks, value went out the window. Paddy can bring his game to Manhattan any day of the week. The guy slings a mean cocktail. Date – Not the unlikeliest of places for a date. They have a nice restaurant area, and if she doesn’t know it exists, you might look in the know for bringing her here. Or if it’s a first date, you might look like a guy trying to get her bombed at an upscale pub. Hookup – Again, not likely, but not impossible. That shuffleboard table can do wonders for your confidence. Dance – Probably not. Not a ton of space in back. Catch up with a friend – Absolutely. 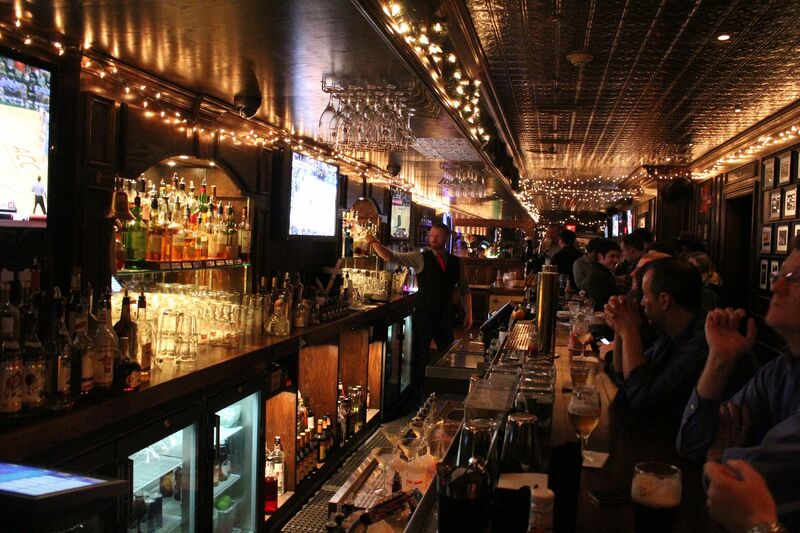 First or last drink of the night – Sure, but if you’re fixing for a low key weeknight- why go anywhere else? Overall – Based on my review, I can’t say enough good things about Cooper’s Union. Equipped with a jukebox, a shuffleboard table, and a feel unlike anywhere else in the Sixth Borough, Cooper’s Union certainly has plenty going right for it. The drinks, from a perfect pint to a bourbon infused beverage, all seem to stand out as excellent. So if you’re in the mood to get away from the same old- forget the Coors Light, throw down a couple extra bucks, grab a seat at the bar, sign up for the next game, and take a look around inside Cooper’s Union. You might forget that you’re still in the neighborhood. 9.0, and one of the best experiences I’ve had in the area.